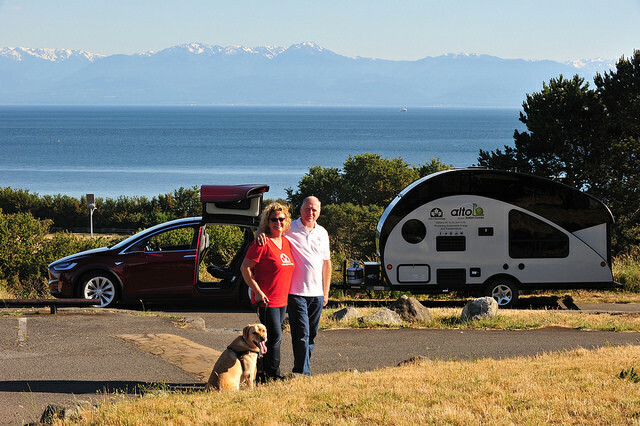 A husband and wife based out of Saanich, British Columbia, have turned their summer vacation into a promotional journey for sustainable energy by embarking on a cross-Canada trek in a 100 per cent electric car towing a sustainable camping trailer. His background is in engineering, hers in business. Now, they share a common goal of changing Canadians' impression of sustainable energy. “I was always interested in alternative energy,” said Rolf Oetter. Their big ideas began with the purchase of an electric car. “We got our first Tesla Model S in 2014,” said Silke Sommerfeld. “That was a big change for us. We really love that car, and it feels good to drive something that is sustainable and environmentally friendly.” The couple has embraced renewable energy as much as possible and even installed solar panels on their home. This isn’t the couple’s first trip. They’ve made the drive from Victoria, B.C., to Fort Lauderdale, Florida, in their Tesla Model S—100 per cent electric car—without the recent addition of their trailer. On this trip, they are driving their newer Tesla Model X across Canada. They chose a streamlined Safari Condo Alto 1723 trailer with a hard shell and retractable roof. It is decked out with solar panels Rolf installed himself, along with stronger lithium batteries for an increased lifespan. The eight solar panels are 100 watts each and semi-flexible. This way the trailer is independent of the car’s plug-ins, giving the car the priority recharging opportunity while in each campground. Technically, the trailer could even charge the car, albeit slowly. Towing the trailer obviously impacts the range of their electric car, but they plan their route based on available plug-in stations to recharge each night. The car’s range is about 260 kilometres when travelling at about 70 kilometres per hour while towing the trailer. Higher speeds lower their range, so Rolf and Silke have been taking their time on their journey this far. 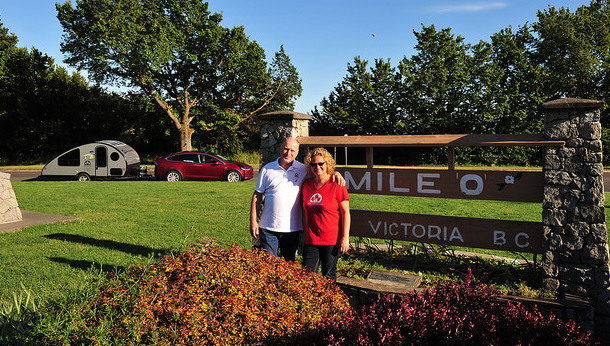 The couple and their dog started their journey at Mile Zero in Victoria on June 11, 2016. As of June 26 they were enjoying Lake Louise, with a scheduled stop in Banff, followed by Calgary and Red Deer. They haven’t planned their route beyond an anticipated stop in Saskatchewan. “This is an adventure for us. We plan about a week ahead,” said Sommerfeld. “We decide where to go when we meet people.” The couple is active on social media and their blog and is open to destination suggestions along their cross-Canada trek. A balance between work and play is important to the travelling couple. 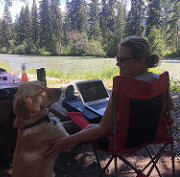 A day on the road begins with packing up their campsite and fully charged car, then driving to the next destination where they set up for a night of relaxation with their dog. “Yesterday we went on a long hike past Lake Louise and into the mountains to see the glaciers,” said Oetter. As for work, they take the time to attend car shows, edit videos and update their blog for those interested in following their trip. Driving through interior British Columbia and Alberta, the couple has had a fantastic two weeks full of breathtaking views. “I love this area of the mountains,” said Sommerfeld. “This area is beyond beautiful.” She has never ventured farther east than Red Deer so is especially excited to continue their adventure east. Obviously, travelling across the country in an electric car has its challenges. “The charging is the biggest challenge,” Sommerfeld said. “We don’t really know what is going to happen beyond Red Deer because it is the last city with a Tesla supercharger.” The couple expects the Prairies to be easier, despite the lack of Tesla supercharging stations. Peavey Marts are scattered across the Prairies, with quick charging stations installed outside. An important note is that Rolf and Silke are not affiliated with or sponsored by Tesla in any form. Their goal is to promote sustainability across the country, regardless of how people choose to join their mission. “We are getting stopped all the time (by people wanting) to talk to us about their plans to become more environmental,” said Rolf. 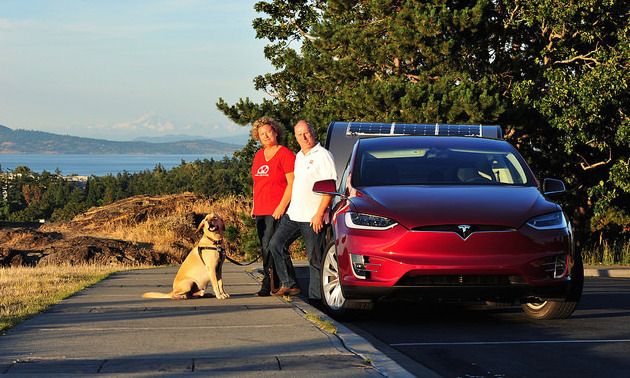 Their cross-Canada trek pushes the boundaries of electric transportation. Kieren Britton will be riding her bicycle across Canada over the summer to raise money towards a cure for prostate cancer. She talks about the plan, the challenges and her inspiration. 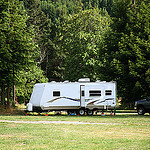 Tips for anyone thinking of buying, selling, leasing, consigning or repairing an RV. 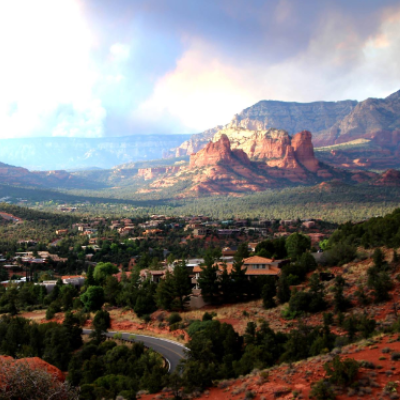 The resort is just minutes away from Sedona Red Rock Country, Tuzigoot National Monument, Verde Canyon Railroad and Montezuma National Monument, among other popular sites.